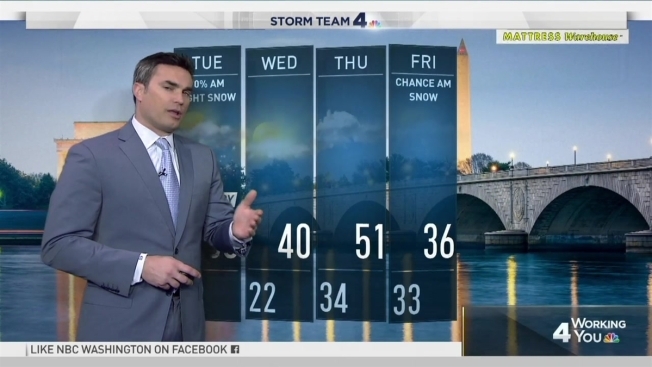 A mix of snow and rain fell across the D.C. area Tuesday morning, prompting several school systems north and west of D.C. to delay the start of class. The snowfall is expected to be brief, moving out of the region by 9 a.m. But Storm Team4 says gusty winds and blustery temperatures will take hold on once the snow passes. The inclement weather prompted some schools to push back the start of the school day. Schools in Montgomery, Frederick, Howard and Carroll counties in Maryland will open two hours late Tuesday. Schools in Warren County, Virginia, also delayed the start of class. The storm will bring chilly temperatures and winds, making conditions feel like the 20s. Conditions will clear up for Wednesday and Thursday, but another system on Friday could bring snow back to the area. Kammerer said he is also watching for a chance of rain and/or snow late Sunday into Monday morning.